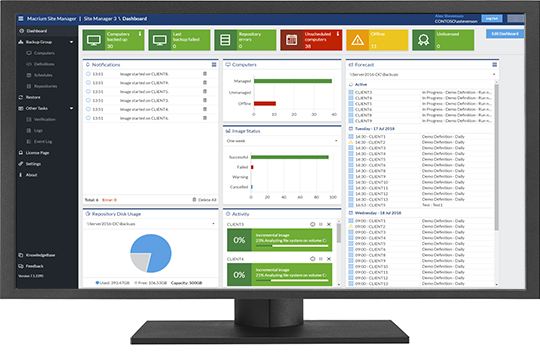 Macrium Site Manager 7 is our central management console for endpoint backup of your site. The first step to site backup is the Starter Pack. As needs grow or change, additional bundles of agents can be easily added - allowing simple management of your backup needs. The MSM is available at no cost and includes a 30-Day Trial for 5 workstations and 1 server. Additional machines and trial period extensions are available on request. Existing standalone Reflect installations can be managed indefinitely. Site Manager: Windows 7 / Windows Server 2008 R2 or later. Agent: Windows XP/Windows Server 2003 or later. The Starter Pack is a great bundle of 1 Server and 5 Workstation Macrium Agent Licenses plus the full Macrium Site Manager console, that allows a small business to quickly and confidently backup systems and data. These cost effective and scalable Macrium Agent License bundles that are for use with the Macrium Site Manager. These agents, specifically for use on Workstations, are only for use with Macrium Site Manager. These Server Macrium Agent License bundles are great value for money when there are many physical machines to backup. These licenses are only for use with Macrium Site Manager. These Server Macrium Agent License bundles for backing up Windows virtual machines running on any hypervisor. These licenses, specifically for use on virtual servers, are only for use with Macrium Site Manager. You can also read a case study about Site Manager here!